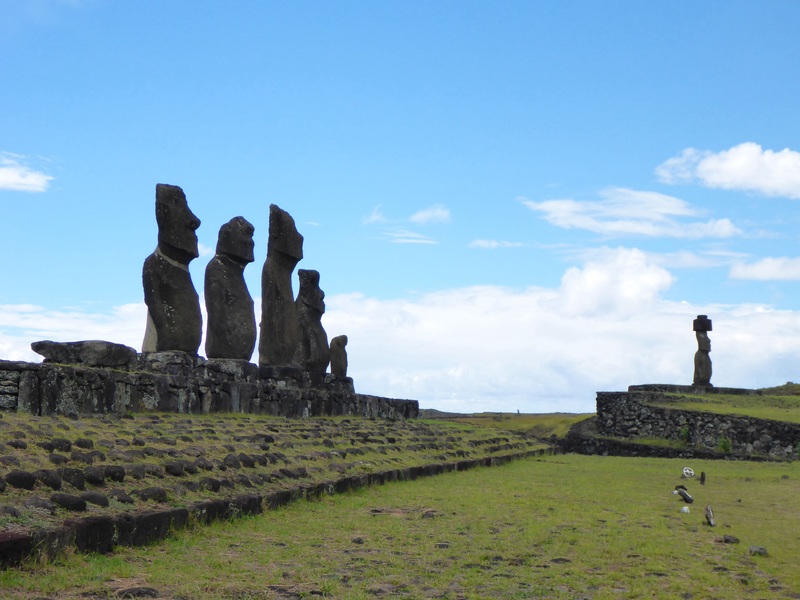 I hardly slept last night – never do before a big trip, because although I love travelling and discovering new places, getting there by plane still scares me, or it could because I am excited at finally going to Easter Island! We leave our hotel at 6am for the airport and are checked in by 6.30. 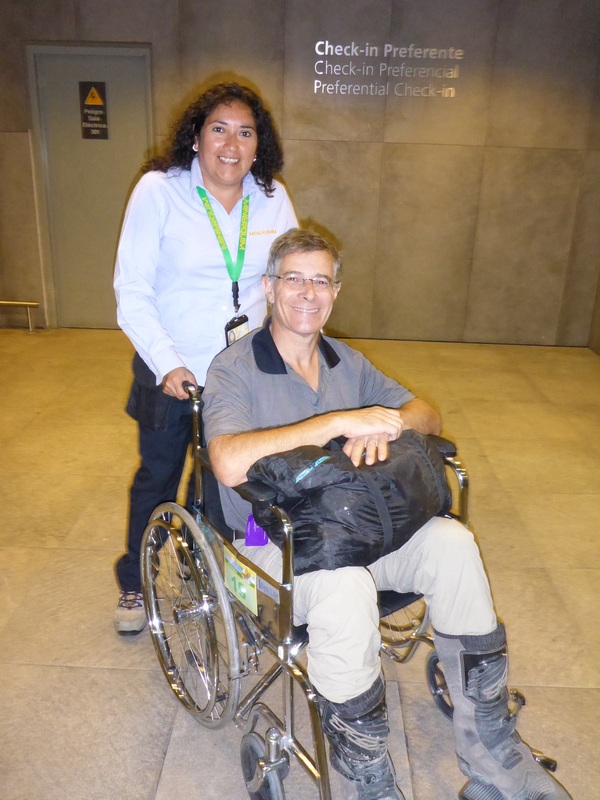 Anthony cleverly thought of calling Lan Chile and asking them for a wheelchair, not knowing how far we were going to have to walk at the airport. When I booked the first available flight to Easter Island, I only got a price, no choice of class. It was a little more than the return flight but I put it down to demand. It turns out we are travelling business premium!!!! I think we are the first to check in and we have a choice of seats – perfect, I have a window seat and Anthony is seated next to me. This is great news. Originally we were seated on opposite sides of the plane. 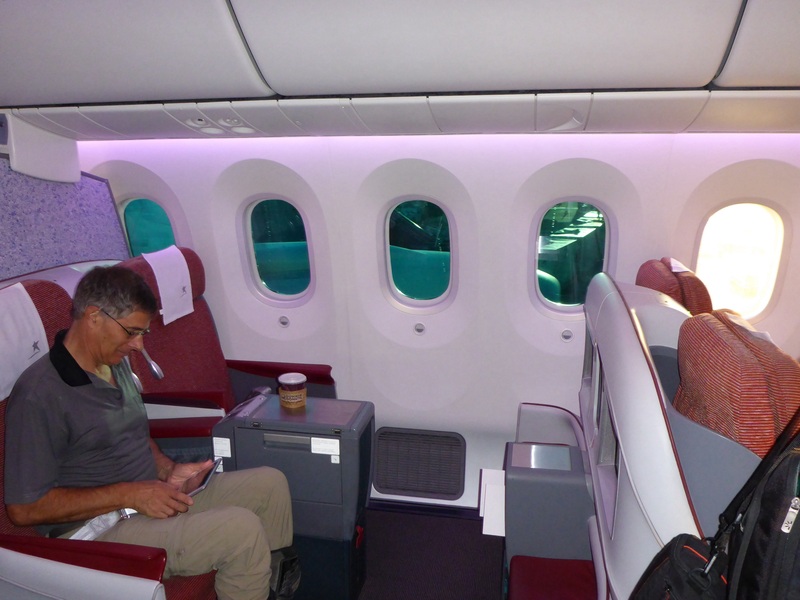 That is not all: we are travelling on our first ever Dreamliner, business class. (At least this particular plane is the first in LAN’s fleet so has been flying for a while, but I find the idea of being in a composite material tube unnerving…) I don’t just have a window, I have 4!!! With personal window glare dimmer control! Lovely crisp white doona/quilts and all the luxuries of business class travel at a level we haven’t experienced before as this is such a new and modern plane. I think we are back in that artificial bubble…. So where exactly are we headed? Easter Island, declared a UNESCO heritage site in 1995, is one of the most remote islands in the world – the nearest inhabited island with 50 inhabitants is Pitcairn Island over 2000kms away. Polysians first inhabited Easter Island in the first millenium but due to introduced Polynesian rat infestation and poor land resource management which led to deforestation and over-population, by the time the first Europeans arrived in 1722, there were 2000 to 3000 inhabitants, down from an original estimated 15,000 a century earlier. Then due to European sailors’ diseases and Peru’s slave raids and delibrately introduced diseases, population here was down to a mere 111 by 1860. 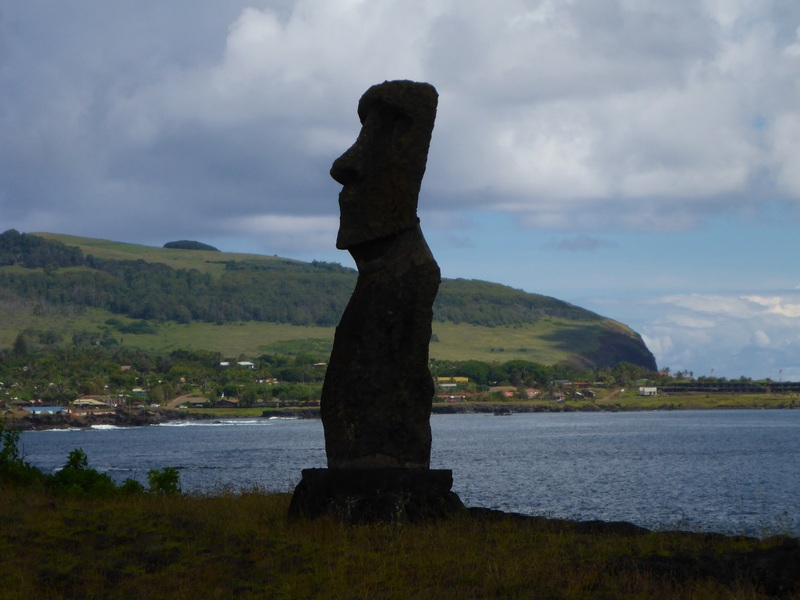 Easter Island is known for its moais – enormous stone statues, mostly with their back to the ocean, scattered across the island. There are many myths and theories abound as to how the first inhabitants arrived and how they erected these statues. The moais, representing deitified ancestors, hold mana (power) that protects the island. 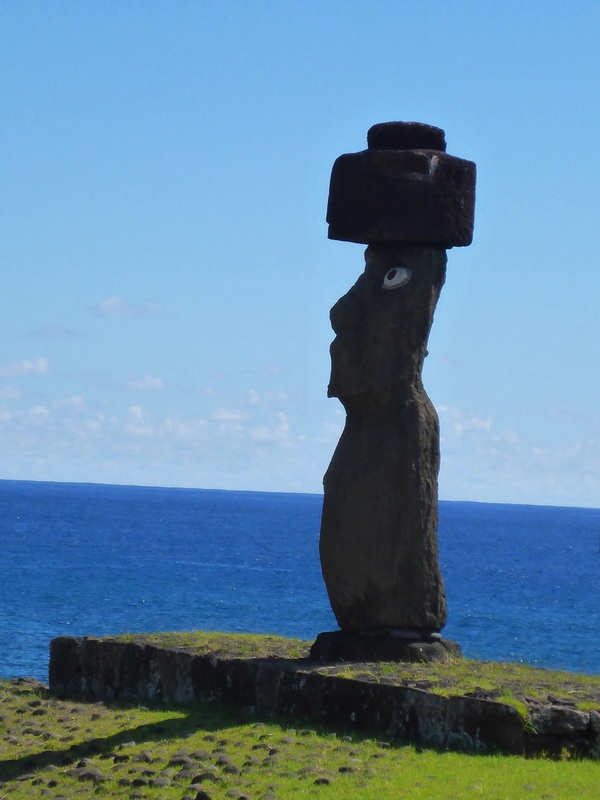 There were no external dangers they thought which they had to protect against, but they needed strength and power to protect the island itself and its inhabitants and bring prosperity and health, hence the moais faced inland, their backs to the ocean. As the island became over-populated and deforested, warriors forced the end of the Ancestor Cult, where ancestors were revered and held the mana, and the Birdman Cult was created (an annual competition of chiefs of different tribes or their representatives based on physical strength, the winner being the first one to return from a 5km swim and climb back up the cliffs with an unbroken manutara (sooty tern) egg and awarded ‘birdman’ status for one year). The last Birdman competition was held in 1867. Apparently in 1722, Europeans noticed standing statues but by 1838 most had been toppled during internal power clashes. 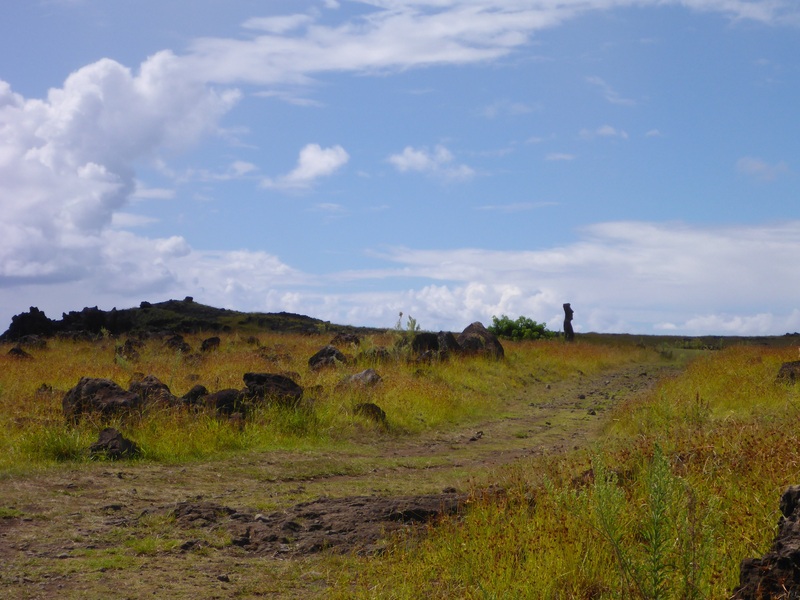 Now, due to the Rapa Nui’s own near extermination and lack of written history (they did have their own hieroglyphs but it has never been deciphered), we are left to speculate on the origins and meanings behind much of Rapa Nui. 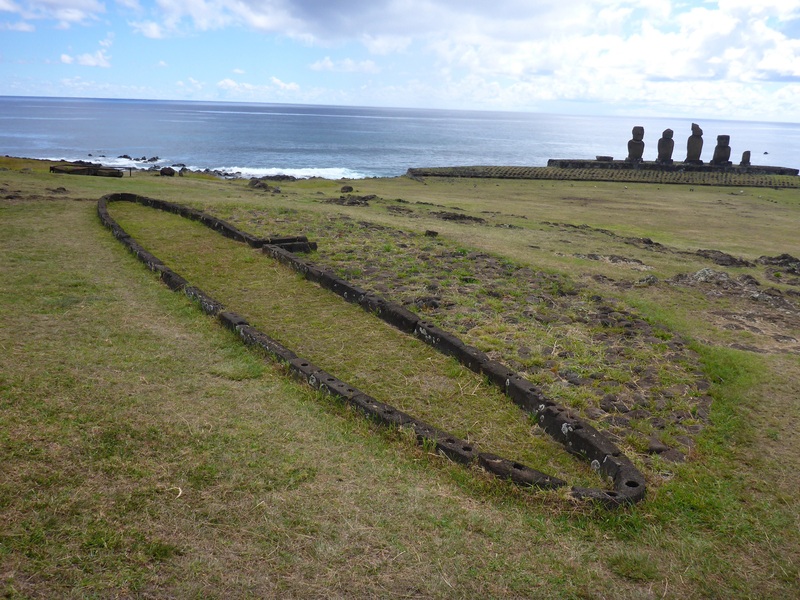 Various carbon datings have dispelled previous estimates as to when Rapa Nui was first settled by Polynesians. There are still many mysteries, unanswered questions and differing theories. This is what makes this place so fascinating. But how tragic that a civilisation just about wiped itself out due to poor resource management out and its culture nearly lost, with expeditioners and missionairies taking its final breath away… This should be reminder to us all of what can happen if we do not take care of our planet and each other… This my crude abbreviation of a fascinating history – you may wish to check out good old wikipedia for a clearer overview at http://en.m.wikipedia.org/wiki/Easter_Island, and of course there are many books. 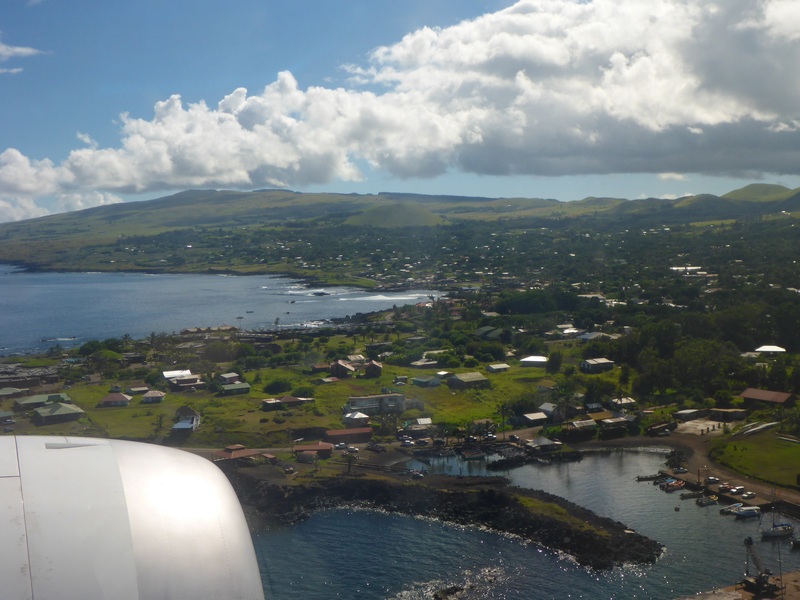 We are 30′ out of Hanga Roa and the captain announces we are about to commence our descent. I am getting excited. Not long now. We are on the left hand side of the plane and we have no idea if we will get any areal view of Easter Island. Suddenly I get my first glimpse of the island – fantastic. Then, what? We are above the runway. 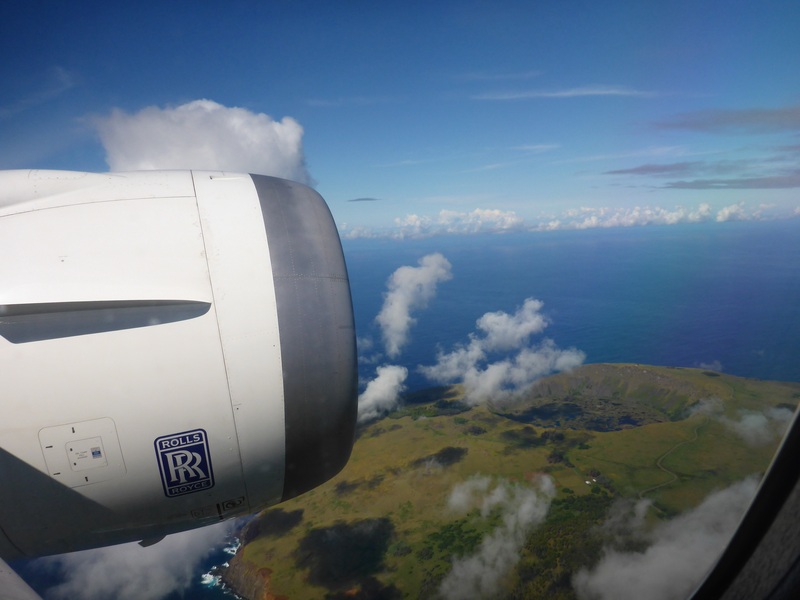 As if to give all passengers a view of both sides of the island, we fly right over the airport, which gives me a view of Orongo crater, then do a right then massive left hand turn, giving me now a full view of the entire island. We need the whole length of the runway, which is also the whole width of the island at that point, then turn back on ourselves to get to the terminal. I spot Anthony’s wheelchair being brought over!! I am the first one off the plane with Anthony slowly following behind. There are many steps down for anyone with such a sore ankle as Anthony. It instantly feels and smells like home: the sea air, the hot humid weather. We need to buy our National Park entrance fees at the airport and the wheelchair attendant takes to the front of the queue (a small benefit to being handicapped) and the ranger refuses to sell Anthony a ticket: just one ticket for the 2 of us with a special note handwritten on the back for the park officials to allow Anthony through. As we get into the terminal, the sweet scent of tropical flowers instantly remind us both of Tahiti. 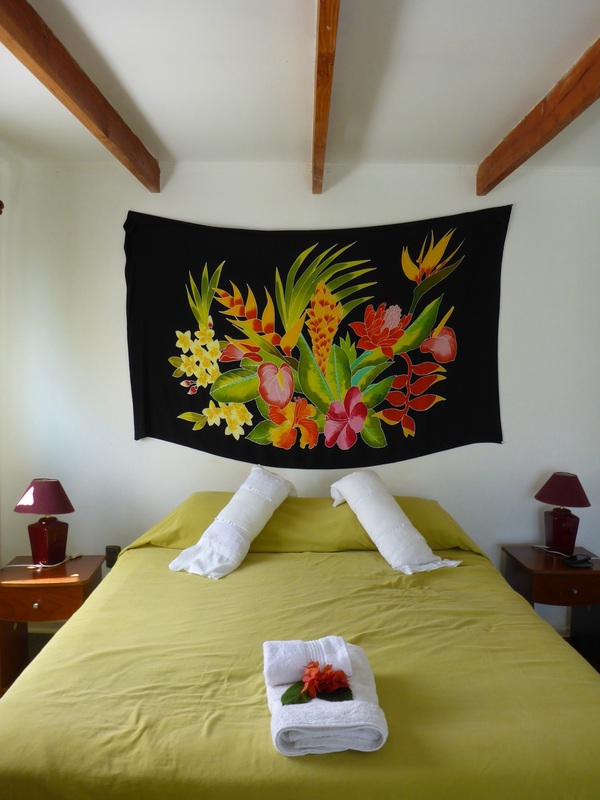 Locals are welcomed by various members of their familes and friends with multiple leis (garland of fresh flowers placed around the visitor or returning traveller’s neck as a welcome). It is such a lovely custom. The love and happiness on their faces is heartwarming. We wait a while for our checked bag and eventually head outside where we find China, our hostel owner, with our name on a board. She welcomes us with a lei each. I do love this custom!! China was born here, from a Rapa Nui father and Chilean mother. 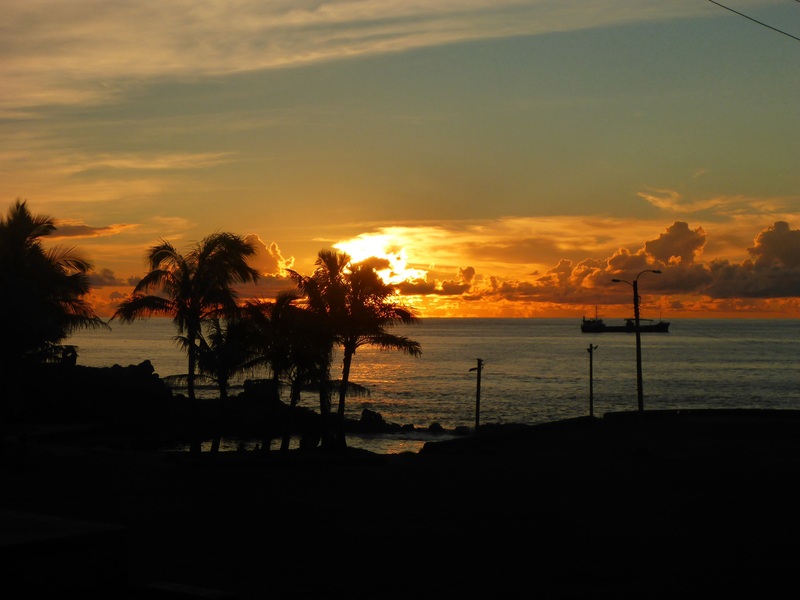 Rapa Nui is the name of the island, the name of its people and the name of its culture. 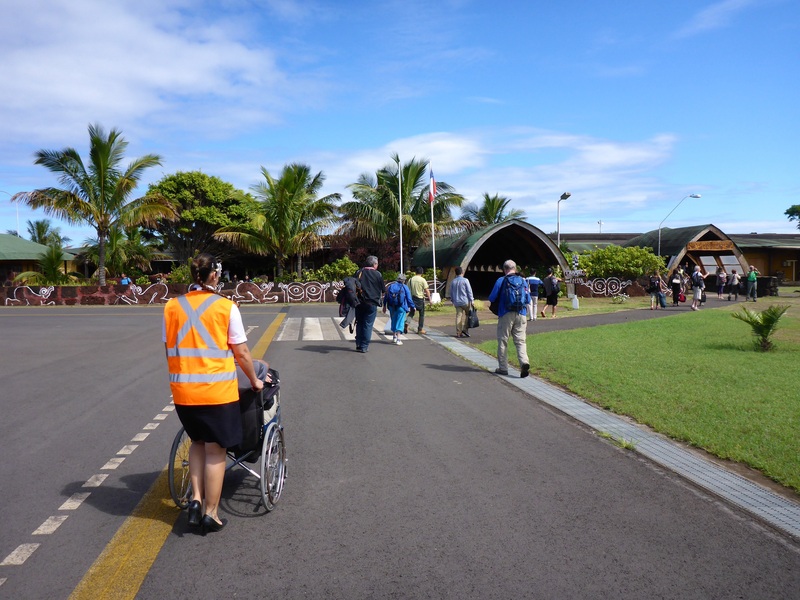 We hop into her people mover and get a mini private tour as we drive through tiny Hanga Roa centre, the only town on Rapa Nui, to our home for the next 5 nights, China waiving to various friends on the way. What strikes me is how neat and clean Hanga Roa is, the streets tarred or paved and there is not a spec of rubbish. It is green and lush, flowering bushes everywhere and people waiving to each other everywhere. You immediately feel a sense of pride in the place. It is good to be with a local who can point out which statues are modern or replicas or restored. We are on the northern edge of town, just past the cemetry, a 10′ walk to just about anywhere in town. 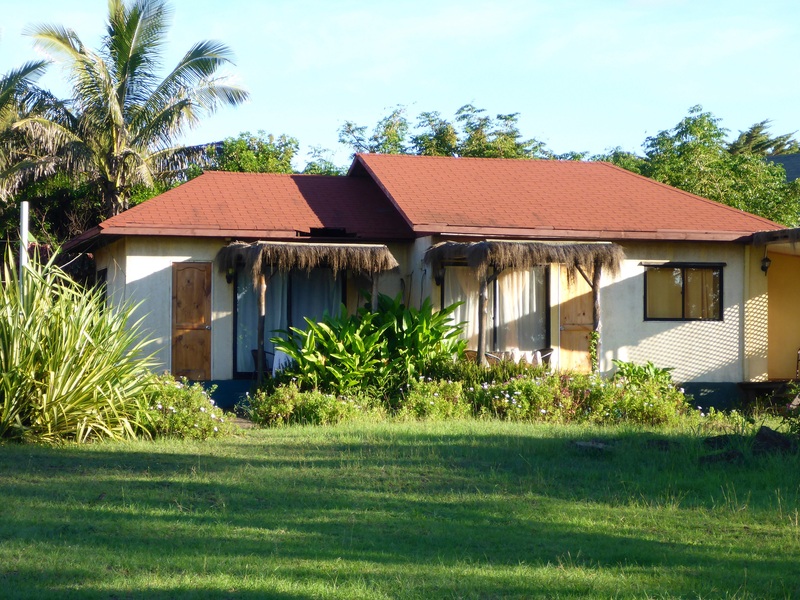 The Sunset Hostal has 2 double cabañas. We are the only guests at the moment which is great. China lets us settle down before coming back with a local map and explaining what local tours are on offer and warning us of the dog problem on the island: there are stray dogs everywhere but they are friendly especially towards tourists who often feed them. China has 4 friendly dogs but they are very territorial so we must not let a stray dog follow us home or an almighty dog fight will erupt. While Anthony rests with an ice pack on his ankle, I set off exploring for the next two and a half hours. First stop is the most beautiful cemetery, across the road from our hostal. The stone and wood carvings and offerings left at each tombstone are exquisite. Somehow, this cemetery feels alive, not forgotten like so many. 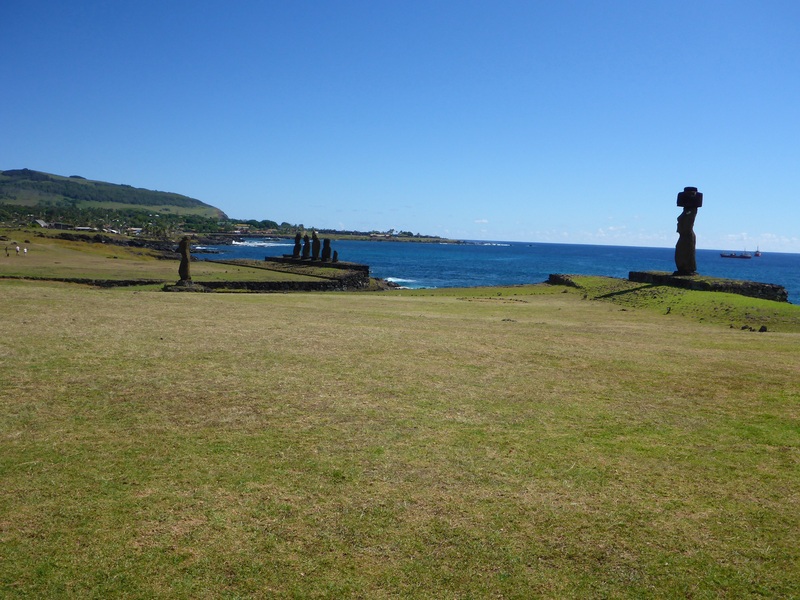 I then walk over to Tahai, an ahu (platform or ceremonial shrine) with 7 moai (stone statues). My first up close ‘contact’ with a moai!!! 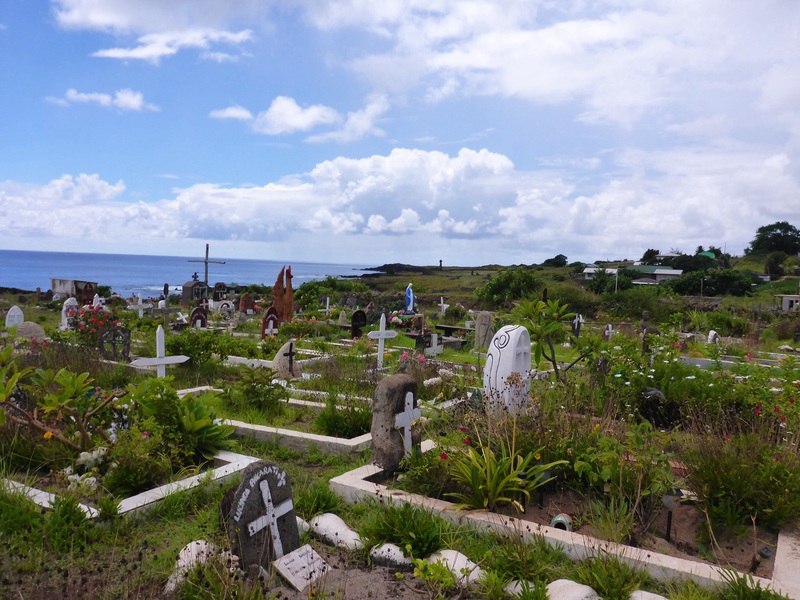 Like most on the island, they face inland, their role being to protect the Rapa Nui People. Tahai has an original ahu with 5 moais remaining and a couple of single separate moais but the buildings have been reconscructed for us visitors for educational purposes. Those moais have an incredible presence. I continue along the coast for another hour. There is no one apart from several wild horses gently grazing and one local fisherman who pops out of the rocks I am standing beside as I looked out to sea, up from the beach below me. We have a quick ‘chat’ and each continue on our way. The tropical heavens open briefly, I get drenched, I am in paradise. After the rain, the lighting is stunning. Before returning to our cabin, I check out a few restaurants close to us for dinner which Anthony could walk to. Outside my selected restaurant, we bump into Mary from Minneapolis who was behind us at the Airport in Santiago. We chat, find out that her host has given her all sorts of incorrect information (the weekly dance show she wanted to go to next to the restaurant isn’t on this evening but tomorrow and the sculptures behind us are not original but replicas – a good reminder for anyone coming here to do some research to find a knowledgeable guide!). We invite her to join us for dinner as she is on her own. We have a great view, one level up, across the sculpture park to the ocean. As the sun sets, we hear lots of barking dogs: about 6 dogs are chasing 2 horses, the dogs are running around frantically while the horses slowly move away. Eventually, the dogs lose interest. The sunset is stunning. 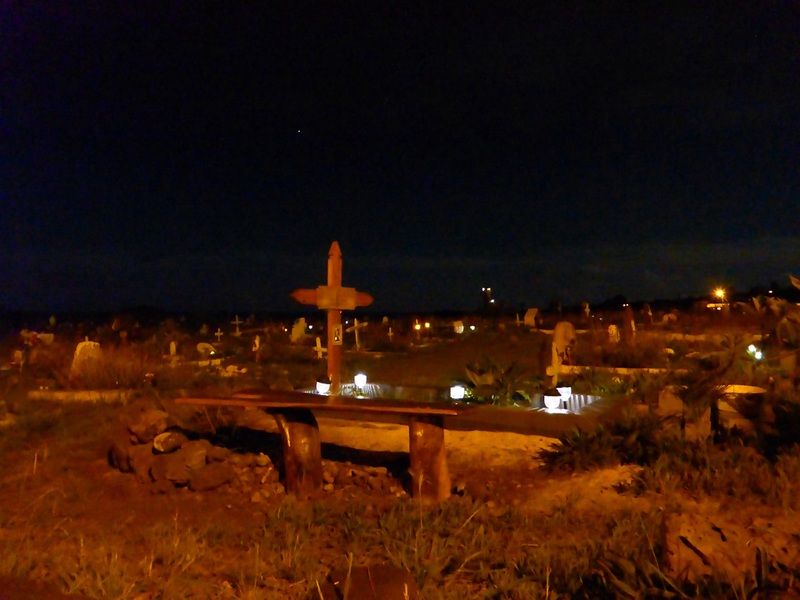 After a lovely evening, a pisco sour for me (a South American cocktail) and locally brewed pale Ale for Anthony and delicious dinner, we return to our home, past the cemetery: even at night it is beautiful as many graves have solar powered candles. The next few hours are spent downloading my new photos to my iPad, captioning the photos from our trip south which I had already uploaded to our blog site last night in Santiago (and 45′ to upload one missing photo) for Anthony’s posts – we are so far behind in our blog!! We have only spent one afternoon and evening here so far, but it feels like so much longer. What a day!!! Tomorrow, China will give us a half day tour – we decided it best to have short tours in the morning so that Anthony doesn’t over do it. Due to the swelling in his foot, he needs to spend as much time with his leg up as possible. It looks just gorgeous!Have you got arnica,Anne? It really works a treat to reduce the bruising and swelling. I hope you have as fascinating a time as we had when we visited some years ago, when my walking was fine! Take it easy and keep the medication up, Ant. Pale ale should be just the ticket. Love from Wiz n Jane. Thanks for the prompt and excellent service fixing the filling that came out as a result of the motorcycle accident. I am sure all will be good going forward. Superbe ! On vous embrasse.